Hi there! I hope you're having a great week! I have a get well card to show you today. I thought it was time to add a somewhat masculine card to my stash, so I kept this one fairly simple with no frills. I used Graphic Greetings Get Well today. I stamped it a couple of times. 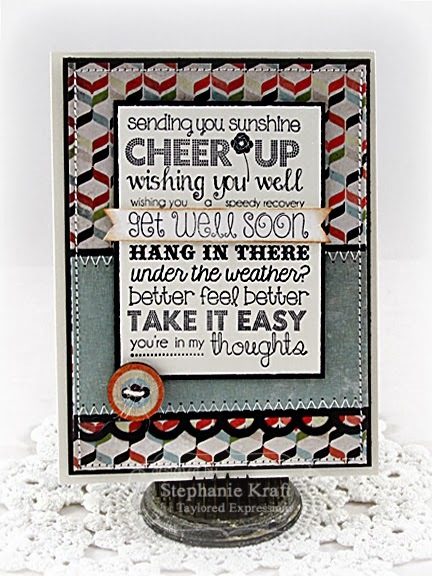 The second time I trimmed out the sentiment "get well soon" and inked the edges, then I popped it on top of the first layer. Accessories: Taylored Dies: Open Scallop Border (TE), Wooden button, Twine, Foam tape, Thread, Sewing machine. Simply wonderful Stephanie! What a great showcase of that awesome sentiment! Hope you have a great weekend!